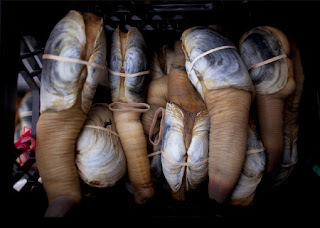 There’s nothing quite like hunting for geoduck, (pronounced gooey duck.) Geoducks, which are large bivalve mollusks, are probably about the strangest living things I’ve ever seen. Describing them comes across as quite dubious. Picture a huge thick oval clam shell the size of a large hand, a soft slimy clam-colored body spilling out its two-sizes-too-small shell. Then imagine a one to two foot long grayish-pink neck, wrinkled and ridged resembling an elephant’s trunk or, as my sister delicately pointed out, a horse’s appendage. When you cut these suckers open to clean them, if indeed you truly crave chewing on the tough rubbery meat, you’ll find a large stomach the exact color and shape of an apple-sized garbanzo bean. That part, along with the other viscera, gets tossed down river for the fish to devour. Michael and I haven’t been able to go camping since Calvin’s birth so I find myself reminiscing about family trips when I was a kid. Every couple of summers my mom and dad took the six of us to the Olympic Peninsula’s Hood Canal in Washington State. That’s where them geoducks hang out. It never seemed to be sunny or very warm on our trips, mostly gray overcast skies and rain. Even so, after a pancake breakfast in our cozy trailer, we’d don rubber boots and ponchos and set out. As a little kid the walk to the delta seemed long to me, my dad and my siblings carrying buckets and shovels, my mom a wooden fold-up stool with a striped fabric seat and a stubby knife for shucking oysters. Sometimes my dad carried me on his shoulders, something Michael and I have never been able to do with Calvin because of his poor muscle tone. Once my dad slipped on a slick muddy log and we fell like a tree into a foot of brownish sludge. We laughed and laughed. Geoducks hang out down deep in the mud and stretch their siphons just above the water’s surface to breath. When the digging starts they retract their necks quick-like. The goal of the hunter is to dig down into the soft silty clay and get a firm grasp on the sucker before it’s gone forever. I remember my dad’s arm lost up to his shoulder in the murky holes he dug. The resulting pit is a foot or more deep and completely obscured by silty water. The jokesters in our family (everyone except my mom)—noting where the holes had been dug—shoved innocent bystanders (me) into them. Ha, ha. Very funny. It’s too bad we won’t likely be able to bring Calvin hunting for geoduck. It’d be a riot.